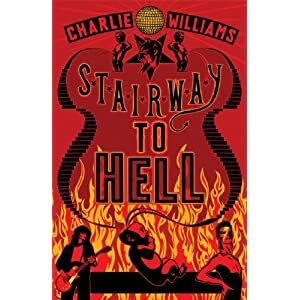 On Charlie Williams’ impressive Stairway To Hell (Serpents Tail; 280 pages; $ 15.95), he weaves a story loosely based on Led Zeppelin’s true-life interest in the occult during the mid-70s, weaving a tale that the guitarist might have done experimentations with soul shifting: a process in which an adult’s soul is swapped with newborn babies, thus creating “hosts” who unwillingly and unknowingly carry live with the souls of famous celebrities. The story opens in a one-horse English town, where a struggling pub singer named Rik Suntan is trying to catch a break in the music business. One night, his manager comes up with a revelation: he suspects that Jimi Page shifted his soul with that of no one but David Bowie, and that he had assembled a group of people whose souls had also been shifted with other famous musicians and sports figures of the past. That revelation changes Suntan’s life, and he goes into a quest to find if his original soul had actually been shifted, and ends up finding out things he probably shouldn’t have. In the meantime, we also find notes purportedly written by the Led Zeppelin guitarist himself – a report on his experiments, its successes and failures. Williams names several real-life celebrities who might have been willing or unwilling participants in these soul-shifting experiments, such as Jimi Hendrix, Cat Stevens and many others. It is clear that the author is well-versed in pop culture, and the somewhat strange behavioral changes of the ‘subjects’: Cat Stevens’ sudden soul-searching and conversion to Islam, David Bowie’s embracing more radio-friendly material and Hendrix’s sudden overdose and death at the height of his career. Reading it was quite enjoyable – this is not exactly high literature but it is a good reading experience for those into rock history and also who enjoy thrillers that have some fantasy woven into the plot – which makes this a good suggestion for this summer’s reading list.